Most of you know my stance on leftovers. I am not a fan. I will eat leftovers once, maybe twice, before I am totally sick of them and have to move on. Even then, I almost never eat leftovers again for dinner; I usually bring them to work for lunch. Tonight, I had leftover curried lentils. It was a wonderful experience. I would do it again. My mom knows what to do with a bag of lentils. They’re really cheap, super healthy and much quicker to cook than regular beans. Plus, they don’t require soaking! She fed our family of 6 many batches of lentils over the years. I asked her for her “recipe” a while back, and she laughed. (You wonder where I get my “little bit of this, little bit of that” cooking tendencies… now you know.) But because she’s my mother and she loves me, she pulled together some semblance of a recipe. It’s not much to look at, but this is just one of her delicious lentil concoctions. My mom makes it a little different every time based on what’s in her pantry. If she had to scramble to actually come up with a “recipe,” then it’s probably ok if you have to mix and match or even omit a few ingredients. This is actually pretty quick and incredibly easy! Sauté the olive oil, onion, garlic and about 1/2 tsp of the curry seasonings in a large pot until tender and fragrant (a few minutes). Add everything else except the raisins and bring to a boil. 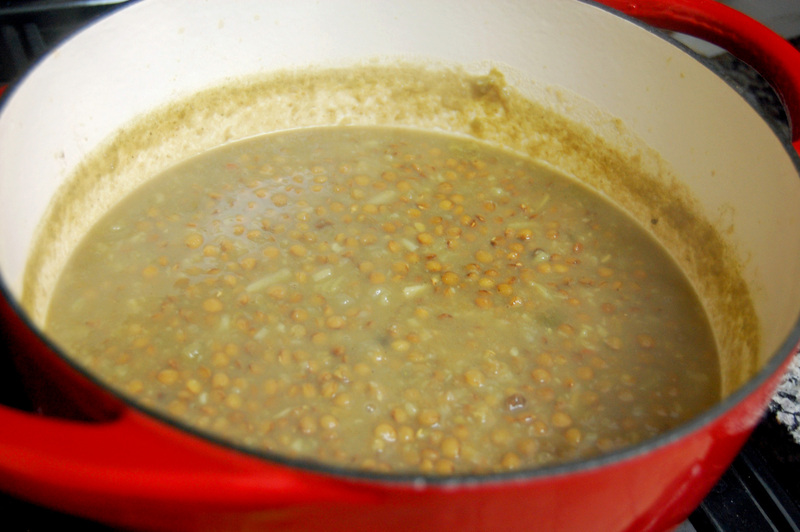 Turn heat to low, cover and simmer about 30-50 minutes (or until lentils and potatoes are tender). Stir occasionally and check to make sure there is enough water. 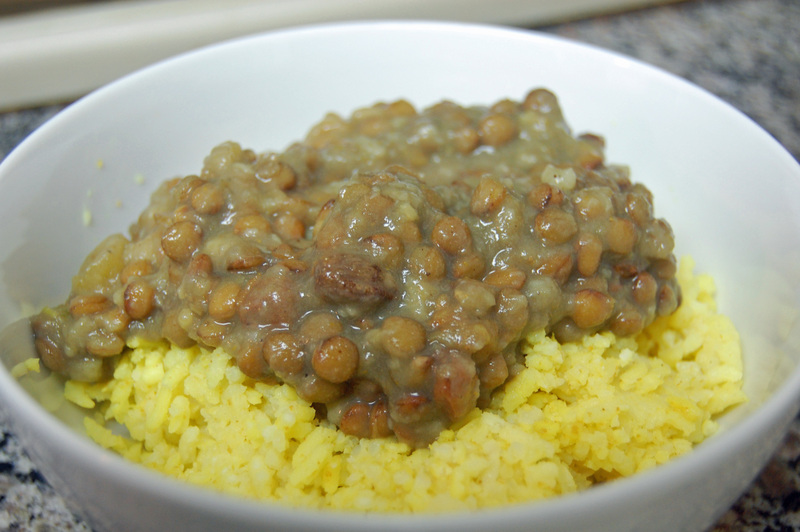 Just taste the lentils every now and then after the 30-minute mark to see if they are mushy yet. 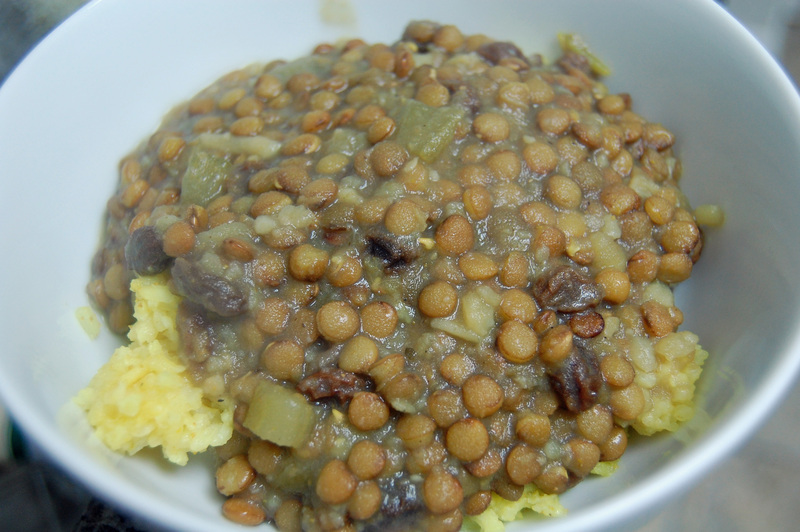 Toss in the raisins once the lentils are tender and cook 5 more minutesto soften the raisins. Add more seasoning if needed. It’s great by itself, but it’s fantastic over seasoned basmati rice. This meal has a really great, mild flavor, even if you’re not typically a fan of Indian-type food. Awww! Thanks for the compliments! The best part is … this dish is actually TASTIER on day 2! on October 21, 2016 at 9:14 am | Reply Rebecca S.
Yes! I actually haven’t made it with the bouillon in years, ever since I started making my own chicken stock. (Though, the chicken stock I use is not very salty). You could add less salt than the recipe calls for and adjust later once you taste it.